If you’ve been a student in the last 100 years, you are familiar with the “Unit” as the primary way learning new skills is divided and organized. The Unit—as in “Class, in our next Unit we will be learning all about proportional relationships”—often lumps together seemingly related lessons and skills that make sense from publishers’ perspectives. But Units rarely reflect the best ways to present new information to students that promote retention and engagement. And so each school year marches steadily onward through a relentless series of Units, ending with a standardized test of some sort. The new school year arrives, the march resumes, sometimes with the topic where it left off, but often somewhere else entirely. At New Classrooms, we knew that there must be a better way to organize learning than the factory-model classroom’s Unit. We realized early on that for us to create a truly personalized classroom, we would need to turn the Unit on its head. One of the first major Research and Development (R&D) efforts we undertook was the creation of a skill map. Instead of the Unit’s linear framework for learning, the skill map describes the interconnected relationships between skills to inform individualized learning pathways for students based on their unique abilities. Until this year, skills on the Teach to One skill map were organized into broad themes around mathematical domains, such as “Geometry” or “Equality and Inequality.” Over the course of a few weeks, a student in Teach to One would experience multiple mathematically-related skills based on a specific theme. But, often we heard from students and teachers that these skills felt disjointed — their connections too academic, too distantly related to be recognized. We found that organizing skills in this way was ultimately not too different from the traditional Unit. This school year, we made a big change to how students experienced skills and concepts on their personalized playlist. Every two-to-three weeks, students are introduced to a story, a real-world mathematical problem or situation. Many of the skills and concepts students experience during those two or three weeks will be necessary to explore the problem and better understand its context. 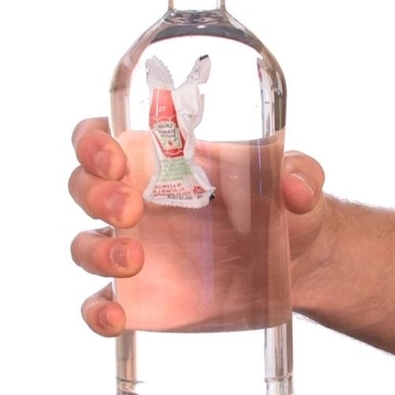 For example, one story asks students to consider why a ketchup packet sinks to the bottom of a full water bottle when you squeeze the bottle. 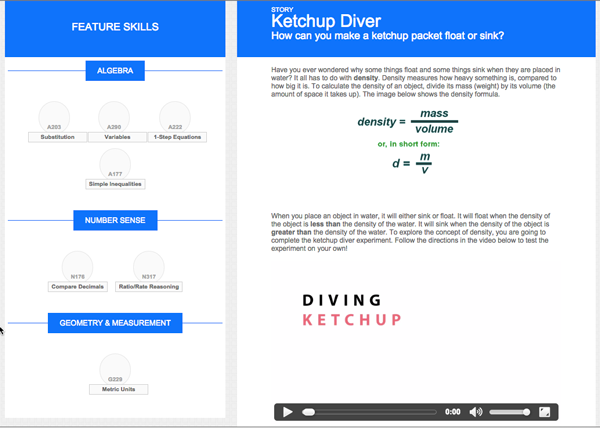 To understand why the ketchup packet sinks, students need to be able to work with density and buoyancy formulas, compare densities, and convert and use measurements to solve problems. In this way, the skills and concepts students encounter are in service of a story, contextualizing them. To date, we’ve introduced more than 100 original stories for students to explore. In part, this development in the Teach to One: Math model was inspired by the work of Jo Boaler at Stanford University. Her research has demonstrated that showing students that they can use math to solve complex and interesting problems can help them learn math skills and increase their motivation to excel. Last spring our Academics team read and discussed Dr. Boaler’s book, What’s Math Got to Do With It?. Stories have enabled students to experience skills and concepts in a way that makes mathematical sense, building strong foundations that open up new learning opportunities. The problems or situations presented in stories are never graded, so students can spend as much or as little time on them as they want. However, they help communicate how discrete skills and concepts are related. Just as in the real world, stories demonstrate the power and beauty of mathematics.